Vivid Live at the Sydney Opera House presents KRAFTWERK: THE CATALOGUE 12345678 TOUR DE FRANCE (2013) in the Joan Sutherland Theatre. Somehow I got through the seventies and eighties without ever knowing KRAFTWERK existed, or even what it was. Kraft made cheese, didn't it? So what is KRAFTWERK? In the seventies and eighties they may have impinged into edges of my reality: AUTOBAHN and THE MODEL, perhaps, even COMPUTER LOVE registered in my life experiences. THE MODEL, definitely. How that happened, I do not know, or, I can't remember, or, I won't tell - repressed motivations, denials. I have always held a kind of hazy idea that KRAFTEWERK were a quartet of lifeless individuals standing behind some electronic music gizmos making fairly bland computer-robotic-like noises that made the electronic geeks of my world go into some form of catatonic effusion. Foamings, perhaps?! Recently, whilst travelling in London, my companion and I heard that KRAFTWERK were to give a series of concerts at the Tate Modern. They had done so at The Museum of Modern Art in New York in 2011. The concerts, in London, were to be given, however, after we had returned home to Sydney. We were disappointed. My companion is a fan, and, I have had an education in my latter time to be more open and adventurous in my musical aesthetics. I have learnt to "HEAR" with more sensitivities and less judgement: a whole wonderful world of appreciation of electronic, minimalistic and contemporary endeavours. These endeavours have opened up, ranging from using cellophane being scrunched, scraped over microphones, or, piano wires twanged, twisted or, tortured with tweezers to elicit waves of sound that were scalding to some of my senses - this exampled at the Conservatorium of Music in Sydney, seemed to give it status, veracity as music; or, computer musicians sitting hunched in one of those weird, breathless vacuums of Impermanent Audio in the very grungy Hibernian House in Elizabeth Street, with just the white light of the computer screen showing the hoodie-clad 'artist' twiddling with his 'thing', whilst beaney-headed, scarfed and bearded disciples, with their awed mistresses holding hands, swigging on the brown-papered bottles or cans of liquid, joyfully looked up to the roof, with each 'blip','blap', 'plink', 'plonk' and 'eeeergh!' from the computer/machine ,as if waiting, invocating "The Claw" (a 'god', from TOY STORY1) to come down and take them to a heaven of ecstasy; to an embrace of even more sophistications of contemporary noises /sounds/music, say, of John Cage, Philip Glass, Wynton Marsalis, Tan Dun, Arvo Part. So, no longer just Bach, Handel, Beethoven, Mozart or Tchaikovsky (Shostakovich) and their ilk. No longer just Duke Ellington, Louis Armstrong, Irving Berlin, Cole Porter, Noel Coward, Lerner and Lowe, Rogers and Hammerstein and their ilk - although, Kurt Weill was there for what I thought was attractive weirdness (Sondheim, too?). The Beatles, Burt Bacharach, Dianna Ross and Michael Jackson, my music appreciations had, significantly, expanded in the zero's of the new millennium! Hmmm! 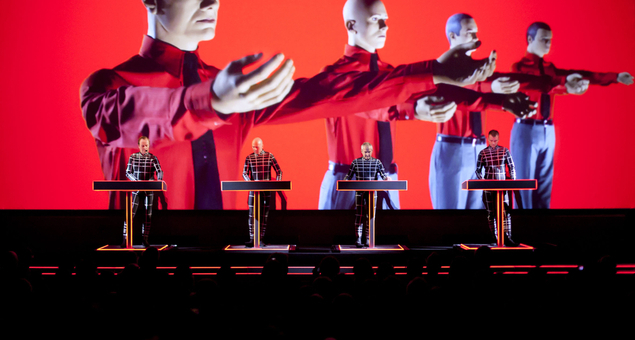 That KRAFTWERK was to be in Sydney was an excitement to rejoice over. Living in Sydney, we had to join the 'bidding' for the opportunity to attend a concert and, fortunately, unlike many of our friends, received seats. Ours were for the TOUR DE FRANCE - A CELEBRATION on the last night of their eight concerts.This was the last concert at 9.30pm on a Monday. The Joan Sutherland Theatre was filled with, clearly, adoring fans. Monday night at 9.30pm!!!! !, really. The only original member of the group, Ralph Hutter led Fritz Hilpert, Henning Schmitz and Falk Griffenhagen onto a beautifully designed set - four podiums spread across the proscenium space carrying electronic equipment - then created a two hour concert of selections from the KARFTWERK repertoire. Besides the music which employs modern technology to create what some call "techno pop" - a minamalistic and strictly electronic, creating a kind of industrial sound with driving repetitive rhythms and simple catchy tunes using a computer software (vocoder) for the 'singing' of lyrics - there is, also, a highly sophisticated use of visual elements: back projected slides and films and 3D graphics - synchronised with the music. The imaging is simply amazing. Wearing the old fashioned 3D glasses, the imagery was the best use of that technology I have ever experienced. Gasps of wonder and spooked disbelief, sometimes erupted from the audience. The sound using multi-diffused speakers around the theatre auditorium, was also the best quality sound I have ever heard. Surround sound of great depth and pleasure. The combination of this aural and visual excellence was a sustaining energy, even, for someone like myself, who was, essentially, hearing a lot of this material for the first time. The lyrics, simple as they are, were most arresting for me when exploring political territory of their 'stuff'. The RADIO ACTIVITY material, with the contemporary adaptation to include Fukishima, for instance. 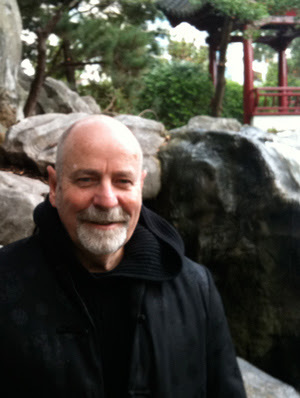 The music has an ambiguity of appeal: it contains, in reception, a kind of gentle celebration and yet 'knowing caution' about the modern world alienation of the human and the rise of robot and computer dependencies. Cool, clean and weird. Memories of 'Hal' from SPACE ODYSSEY, 2001, along with 'David' from PROMETHEUS, kept my body prickling with a little twinge of, dare I say, incipient fear? Mr Hutter has talked about KRAFTWERK's influences, and they bestride the breadth of say, Karlheinz Stockhausen at one end of the spectrum, and The Beach Boys, at the other. This classic sophistication and the simply expressed joyous, the intellectual and the visceral inputs of these two sets of artists, may account for the longevity of this groups' work. Brains and heart. Responsibility and celebration. I had, we all had, a very satisfying night. Kraftwerk can be translated as 'power station' and that is what the night was. Great, gentle escapism with a slightly unsettling 'message'.